What a DBZ shrine to Raditz? Welcome to the Realm Of Raditz. I made this site because most other sites are dedicated to Gohan, Vegeta, or Trunks. What about the other Saiya-jins? 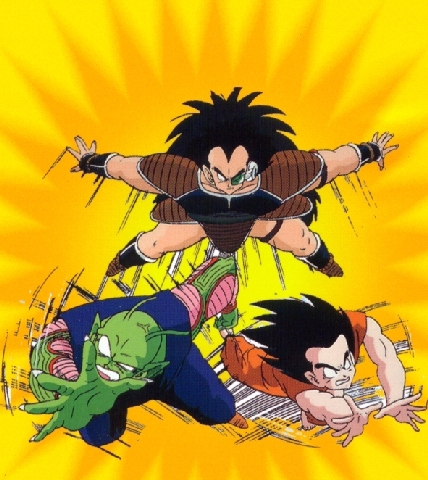 Raditz was the first villain in DBZ to defeat his brother Goku. Yet Raditz is forgotten by alot of people. That's why this site was created. I created this site because I always thought Raditz was a great character. Yeah we don't see much of Raditz, but during the time he was around he made a big impact. So sit back and enjoy your stay at the site. And if you're bored enough, the message board needs some new members. If there is something you think would be good for the site, then post it there and I'll see what I can do. And please sign the guestbook. Click here to access my forums. The image section is up finally. I'll add more to it soon. I also added a new picture in the Super Saiya-jin Raditz section. I'm back. I'm working on the site abit now. I'm going to improve on the stuff I currently have up on the site, and add more stuff in the near future. The site images will be down for a week, possibly two, while my computer is getting fixed. My computer problems is why I haven't updated the site in awhile. I saved all the images and stuff, and they'll be back up soon. When I get my computer fixed I'll make a update. So later for now. Sorry for the lack of updates. Hopefully I can update the site soon with some cool stuff. I've also been working on my other DBZ site. I'll make a real update sometime soon. I did add a couple of links. Added two links. Nothing much. It's been awhile since I updated anything. I added the Why Raditz and Super Saiyan Raditz pages to the site. I also added a new link. And the counter keeps getting screwed up, so I may have to get a new one. I'll try to update sooner. See ya Later. I originally planned to update bios and summarys, but Tripod is having trouble today. So I can't hardly do much today. I'll try to make a update tommorrow, if the site lets me do anything then. I did manage to get a Raditz quotes section up though. I added bios for Vegeta and Gohan. I hope to add Piccolo and Nappa's bios tommorrow along with the Saiyan Saga summary. THE REALM OF RADITZ LIVES! Yep the site is crappy looking now. I just started creating sites, and I'm still trying to get used to the colors, designs, etc I want to use for the site. The colors will be changing a bit more in the next week or so. And I finally got a guestbook added. Please leave some site suggestions there please. As we all know, Dragon Ball Z was created by Akira Toriyama.